Restorative Therapies, Inc., the leading Functional Electrical Stimulation (FES) company, today announced that it has appointed James Janicki as Chief Executive Officer, effective from January 1, 2018. Mr. Janicki has also been elected to the Company’s Board of Directors. Xcite multichannel FES for neuro re-education. Restorative Therapies' founder and former CEO, Mr. Andrew Barriskill, will now take on the role of Chairman of the Board of Directors and Chief Innovation Officer. This planned leadership transition is part of Mr. Barriskill’s long-term vision and strategy for further growth and to strengthen the preeminent position of Restorative Therapies in the market. Restorative Therapies is a leading innovator, manufacturer and distributor of medical devices that provide clinic and in-home therapies for people with neurological impairments including stroke (CVA), Multiple Sclerosis, Brain Injury and Spinal Cord Injury (SCI). Restorative Therapies product line includes the RT300 FES cycle, RT600 FES stepper and the new Xcite FES clinical station. Prior to Mr. Janicki’s appointment as Chief Executive Officer, he served at Becton Dickinson and most recently as the Chief Operating Officer at Arx Pax Laboratories in Los Gatos, CA. 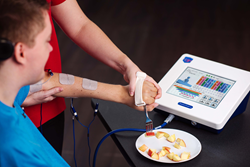 “I am incredibly excited about Restorative Therapies’ business, and I sincerely appreciate the Board's confidence in me to lead the Company as we accelerate delivery on our mission to bring Functional Electrical Stimulation therapies to people with a neurological impairment.” said Mr. Janicki. "Restorative Therapies already has an exceptional team of talented people and a strong product offering. I am confident that Restorative Therapies will accelerate along its growth profile as we introduce our FES systems to more clinics in the USA and internationally." Restorative Therapies mission is to help people with a neurological impairment or in critical care achieve their full recovery potential. Restorative Therapies combines activity-based therapy and Functional Electrical Stimulation as a rehabilitation therapy for immobility associated with paralysis such as stroke, multiple sclerosis and spinal cord injury or for patients in critical care. Restorative Therapies is a privately held company headquartered in Baltimore, MD.